I came across a recent reply to an Autodesk discussion about creating rectangular patterns with unequal spacing. In the past it was accomplished by suppressing the (patterned) features you didn’t require. However if the spacing didn’t align with your needs, then it was not feasible per this method. Another trick was to break down the overall pattern into smaller ones, but the end results meant you had to manage separate patterns within your model and drawing. 1. On your Inventor part, first define a sketch on the face where the pattern will reside. 2. 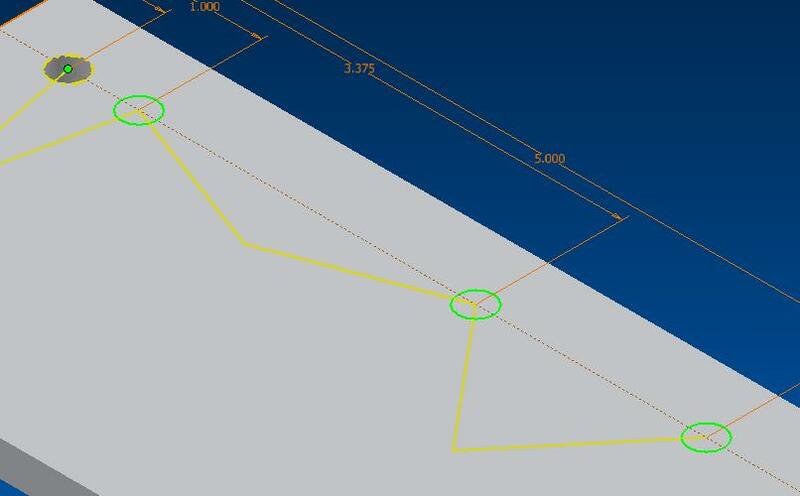 Now draw a horizontal/perpendicular construction line from one side of the plate to the other. This construction line represents the center of the first row of your pattern. 3. Next place a dimension to locate the horizontal construction line from the top. 4. Now draw a random zig-zag line (as shown) where the ends of the lines touch and are constrained to the horizontal construction line. 5. Each point located on the construction line represents the center point of the patterned feature on the first row of the pattern. Adjust the sketch depending on the number of patterned features you require. 6. Using the first line you created for your zig-zag sketch, select the equal constraint icon and set all the other lines equal to it. 7. For future modifications of the pattern, the only constraint that should be applied to the lines is the equal constraint as shown. Remove any other constraints that were applied when you sketched the zig-zag lines. 8. Next dimension each location where the centers will be created. 9. At the start point of your zig-zag or pattern, create a sketch point. 10. Select to finish or exit your sketch. 11. 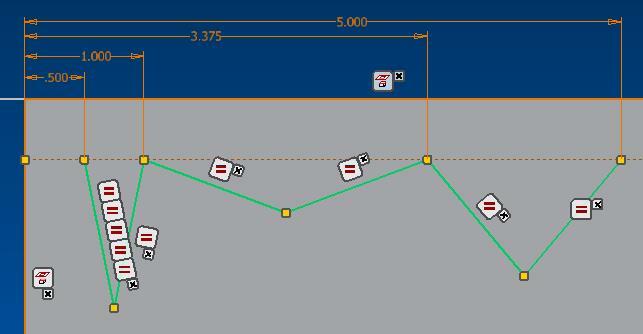 Now create a hole using the hole function and place the feature at the first point on the zig-zag. If the (hole) placement is set to “From Sketch”, the hole should automatically appear at the starting point of the pattern. 12. In the Inventor browser window, expand the hole feature and turn the visibility “on” for the hole sketch. 13. 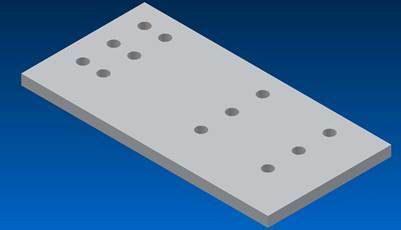 Next, start a rectangular pattern and select your hole as the feature to pattern. For “Direction 1”, select the zig-zag line (path) you sketched earlier. 14. 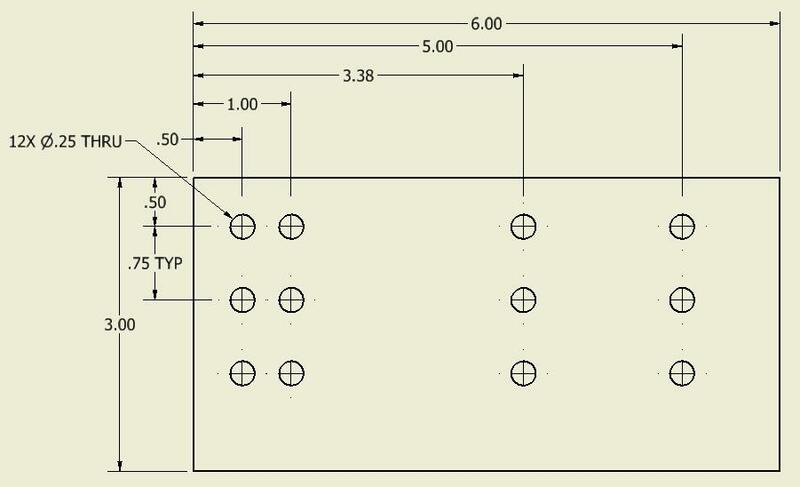 Set the pattern quantity to 4 or whatever quantity you need. 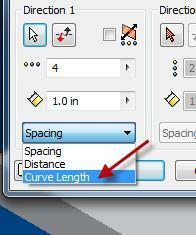 Set spacing as “Curve Length”. 15. 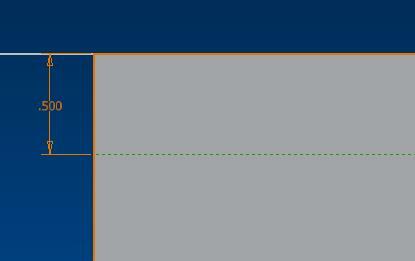 Once you set the spacing to “curve length”, the pattern preview should now show the feature patterned at the spacing we indicated earlier. 16. Next, define “Direction 2” of the pattern along the side of the plate. Enter the values for quantity and the required spacing. If needed, “Direction 2” could also be defined using a zig-zag sketch if unequal spacing is required in that direction as well. 17. Select OK to create an unequally spaced pattern. If required, turn the visibility of the hole sketch back off. 18. At any point when the pattern values change for your design, edit the zig-zag sketch and modify as required. 19. 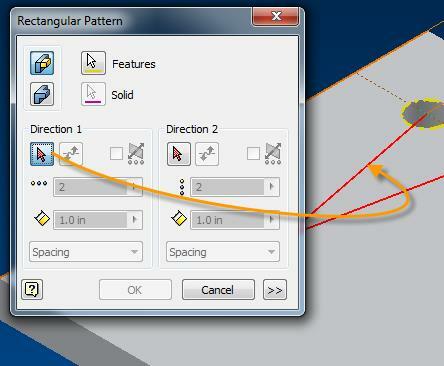 This alternative method allows you to place the zig-zag sketch as a separate sketched feature in the Inventor browser window. If you prefer this type of arrangement, use these steps instead of steps 7 through 10.
b. Define a user defined work point at the start of the zig-zag pattern. c. Now create a hole using the hole function and place the hole at the work point that was created. Remember to change your hole placement to “on point” and define the hole direction as well. d. If required turn on the visibility of your zig-zag sketch. Information regarding this workflow was provided per the discussion I read here. Thanks to user “forbillian” for sharing his workflow with the Autodesk community.